It’s finally here! Hubsan’s brushless unicorn has arrived. Right out of the box the Hubsan is ready to go. Just load some batteries in the transmitter, twist on the props (clearly marked so you get the right direction) and give the lipo battery a little charge. Yes, it does have some juice right from the factory, but that is just a storage charge. First time you run this thing we want full power. The battery is definitely stuffed in there so carefully remove it, don’t just yank on it because the wires get caught up a little. By this time you will notice how solid this quad feels, its not heavy but it has some weight you can tell this isn’t some cheezy toy. The gold brushless motors are anodized and actually give it some class. The shell is a thick ABS plastic and will take some abuse, I would be very careful when landing as these led landing gear tear-drops shells things seem like they would smash on cement. The charger that’s included with your h501s isn’t anything to be proud of, this is the only thing that disappoints me as I can’t see why Hubsan just won’t anne up and include a decent balance charger… so do h501s a favor and grab a better charger when you get more batteries they will last alot longer. One of my favorite things about all the Hubsan models are the transmitters and the FPV2 just brings it all home in a simple little package. Full on screen display HUD with all the important details like gps data, lipo levels and more. Buttons for snapshots, video rec, return to home and flight modes are all easy to reach. You do also have a port to plug in a set of fpv goggles (I use the Eachine VR-007 just fine) or DVR when the LCD screen gets hard to see in the sun. Pretty simple but people will look at you strange as you need to do a little dance when dialing the system in. Hold the THROTTLE stick all the way in the DOWN position. Hit the GPS button until you see “Calib Compass 1“. Last you need to point the H501S “Nose Down” and spin yourself again around 2 more times clock-wise (to your right) until the “Calib Compass 2” disappears from the screen. Pull the Sticks Down and Away until the motors are completely started. Repeat this to STOP the motors once they are started. At this point I was not surprised how easy this thing was to get in the air. Literally within the hour (yes I’m impatient) I was being chased around with it in follow me mode. 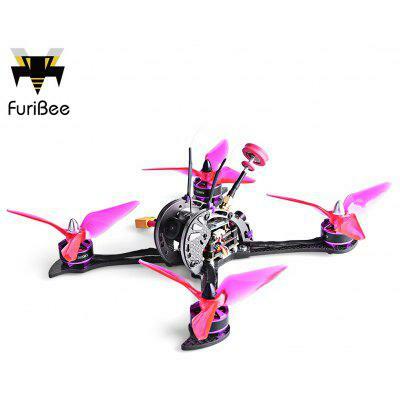 Power and response is awesome, seriously for an RTF quad this size and price you can’t beat it. Quiet creeper at first, once you get the feel of it you’ll be ripping all over and you can hear these props just grip. Later on you can use the altitude hold and follow me for some killer video shots. Understand, this does not have a gimbal, but I’m still not complaining because the video you do get is really steady and for the most part the target stays centered. By the end of you flight, you got a lazy mans button… just hit the return to home and it will come right back (mine comes within about a foot or 2 to the actual spot I mark). If you do get carried away and run the battery down, the h501s will just softy descend and land where its at so still be mindful of your voltage. One last note: if you are using a set of fpv goggles other than Hubsan, you won’t have the on screen display but they still work fine… just channel search or plugin to the side of the transmitter. What sort of wire i have to use to conect a farshak attitude v3 to the husban h510s transmitter. Ore it works whit wireles. wireless, you need to just use the correct channel..
does it have an onboard locator? for if it runs out of battery and lands somewhere? no it does not… it does alert you and give you a little time to return… but if its too low, it will just land where ever. It does not have a locator. But if you leave the controller turned on you can see the co-ordinates of its last location. Do not turn the controller of because you will lose them. At Geekbuying it’s $225 with the transmitter now, is it a good deal?